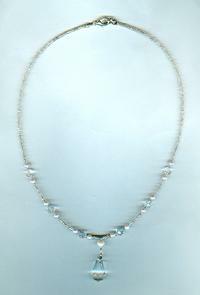 The palest pink glass pearls imaginable glow serenely against a background of sparkling sand-coloured seed beads. Together with 6mm faceted crystal beads, they make up an 18 inch strand which closes with a silver plate lobster claw clasp. The dainty clear crystal pendant dangles about 1-1/4 inches below the strand. This paean to pink stars a lampwork glass focal that?s about 2-1/4 inches in diameter. The pendants in this set are made of glass mixed with a metallic element called terbium.